"Insane in the Mainframe" is the forty-third episode of Futurama, the eleventh of the third production season and the twelfth of the third broadcast season. It aired on 8 April, 2001, on Fox. Fry and Bender are admitted to an insane asylum for criminally insane robots after being arrested for holding up a bank. Fry becomes so deluded by the place that he begins to believe he is a robot, and is released from the asylum. 1.1 Act I: "Hooray for Zoidberg!" 1.2 Act II: "What do you say we plead insanity?" 1.3 Act III: "I find that offensive!" 1.4 Act IV: "I need to get a disguise!" 1.5 Act V: "Do you have any better hostages?" Act I: "Hooray for Zoidberg!" Following a celebration of Zoidberg's ten years with Planet Express, Fry realizes that he hasn't planned for his future, so he spends 94% of his retirement fund (a $100 bill, stored in his sock) on Whif -N- Win lottery tickets. After winning nothing, he decides to open a retirement account for $6, making him immediately $4 overdrawn. At the bank Bender meets his old friend, Roberto, and he and Fry accidentally help him rob the bank. Act II: "What do you say we plead insanity?" Fry and Bender appear in court, represented by the Hyper-Chicken. Fry is going to reveal that it was Roberto who robbed the bank, but is cut short after Roberto calls and threatens to kill him. Hyper-chicken convinces them to plead insanity under the reason that he is their lawyer, and is successful. Both Fry and Bender are sent to the HAL Institute for Criminally Insane Robots because being poor was recently classified as a mental illness and the human asylum is overfilled. Act III: "I find that offensive!" Fry finds the physical exam, designed for robots, quite painful, but is still thought to be a robot, due to the simple fact that the asylum is for robots. He is put in a room with Malfunctioning Eddie, who explodes when introduced to Fry. Unit 2013 shows him around the building and introduces him to the other robots. Bender enjoys himself, but Fry is taking the experience badly, and starts going insane. Eddie is discharged and Fry's new roommate is Roberto, who is in the asylum because he robbed the same bank again. Soon, Fry is "cured"--believing he is a robot. Act IV: "I need to get a disguise!" Fry returns to Planet Express, where he tries to find his primary function. After trial and error, Fry determines he is not a tool bot, a calculator or a food-mo-tron. Fry drinks an exorbitant amount of alcohol to "fuel his power cells" and passes out. Meanwhile, Bender and Roberto escape the asylum. Act V: "Do you have any better hostages?" Roberto holds up the same bank a third time and he and Bender flee to Planet Express. Roberto uses Zoidberg, Hermes, Leela, Amy, the Professor and Bender hostage. He decides to kill some of them, but Fry wakes up and informs everyone that he has found his primary function--battle droid. Fry engages Roberto in battle by swinging his fists in circles around his body. Roberto stabs him, but hits a can of pi-in-1 oil in his coat pocket, which starts leaking and convinces Roberto that he is a battle droid. Roberto throws his knife at Fry, cutting his arm, and jumps out the window where he is arrested. Fry notices the blood from his cut arm and finally realizes he is a human. The title of the episode is a reference to a lyric from the song "Insane in the Brain" and mainframe computers. "Insane in the Brain" would later be referenced in "The Why of Fry", in which one of the Brain Spawn says "are you insane in the membrane?" Electroshock therapy is currently a rare last-option treatment for mental patients with depression, obsessive compulsive disorder, psychosis, and manic-depressive schizophrenia. In the future, however, it is a pleasant treatment that helps robots relax. This is due to electricity having a psychoactive effect on robots. Hermes has a button on his calculator labeled "Carry The One". 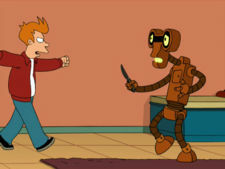 Fry, believing he is a Battle Droid, begins attacking Roberto with a "fighting style" similar to the one used by Bender against El Chupanibre in "I Second that Emotion". This episode is the last to feature a fake sponsor before "Bender's Big Score Part 1". There appear to be two incinerators in Planet Express, on the wall of Hermes' office and in the Planet Express hangar. This episode marks the first appearance of Roberto. When the robot receiving radio transmissions from the CIA opens his mouth, the female voice details the cafeteria menu for the week of May 15th. Season 3 is based in 3003. The week of May 15th begins with Monday, May 15th. Bender's banjo makes its third appearance. Bender is later seen dressed up as Napoleon again in "Godfellas" and "Decision 3012". Fry says that he will continue to never wash his left cheek again after Leela kissed it. Leela previously kissed his left cheek in "The Luck of the Fryrish". Whitey: Counsellor, what evidence do you offer to support this new plea of insanity? Whitey: Insanity plea is accepted. Fry: But I'm not a robot like you! I don't like having disks crammed into me, unless they're Oreos, and then only in the mouth. When Fry and Bender are boxed up and rolled out of the courtroom, Fry shouts "ow, my head" when he is on his side then "ow, my feet" when he is on his head. When Fry and Bender are boxed up, the bailiff clearly tapes the box up next to the opening, not on the opening. Bender is raised off a conveyor belt with a giant magnet, but it doesn't corrupt his inhibition unit. Magnets only affect him when they go near his upper chest or head. Bender exclaims "Je suis Napoleon" at one point in the episode, which means "I am Napoleon" in French, but the French language is supposed to be dead and not understood by anyone in the future. Then again, speaking a language that's been dead for years might be a sign that he's mentally ill (and, in a lot of old cartoons -- specifically the Looney Tunes and MGM ones -- a character claiming that he was Napoleon was a sign that he was crazy). If the asylum is only for robots, then why were Fry's clothes sucked off him by that tube? And why was he given a gown to wear? Since robots don't wear clothes, this seems odd in a robot asylum. They probably have that tube for robots who are so defective ("crazy") that they think they're human and try to wear clothes. The gown could also be for that reason (or for censorship by the network, since showing Fry naked would have caused problems with FOX Standards and Practices). Nurse Ratchet is a reference to the character Nurse Ratched from One Flew over the Cuckoo's Nest, and perhaps also the Autobot Medic Ratchet who is a character in numerous Transformers series. Another robot is modelled off the Mad Hatter from Alice in Wonderland. Dr. Perceptron is a reference to a concept from artificial intelligence. The HAL Institute for Criminally Insane Robots is a reference to the computer HAL, from 2001: A Space Odyssey. This page was last edited on 19 August 2017, at 16:11.